Camping requires lots of energy so cooking is a critical component of a successful camping trip. Hot food in the backcountry can really brighten up your day. As detailed on the Emergency Supplies for Hiking page, having fire in the backcountry is critical - consequently you should have a variety of ways to start them. 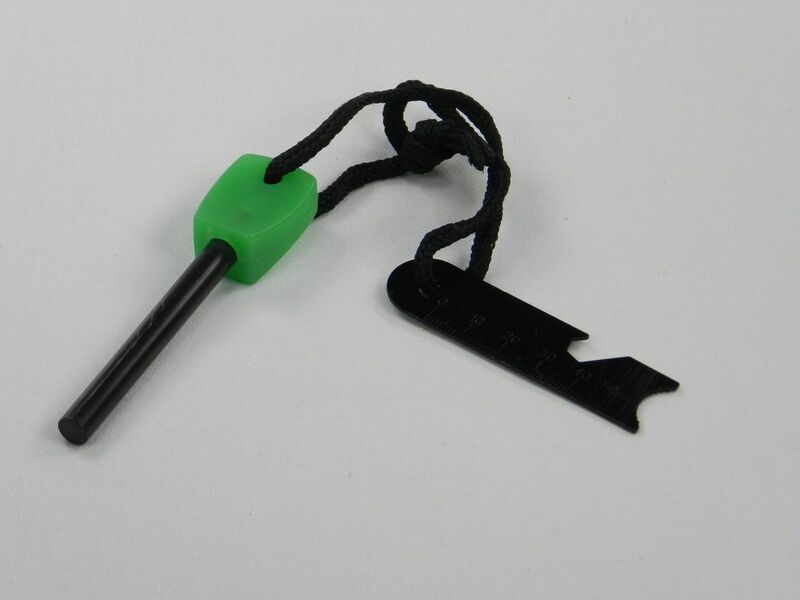 To build on the fire starting gear that we listed for Hiking (disposable butane lighter, waterproof matches, waterproof firestarter blocks and a waterproof match case), when we are Camping we also take a fire starting rod as a last resort. The criteria that we use to evaluate fire starting rods are: 1) reliability of sparking, 2) sturdiness, 3) visibility or the rod against the ground and 4) rod length. After looking at lots of options the rod that we like the best is the Magnesium Striker Flint and Steel Rod by Grizzly Survival. We like it because at approximately 4 inches in length it feels good in your hand. The magnesium sparks hit 5,500°F and consequently work well with all kinds of tinder. The green end piece also makes it easy to see in the dirt if you drop it. Just remember to scrape the protective coating off the magnesium first and you’ll be able to start a fire in no time. You can buy this fire starting rod at Amazon. 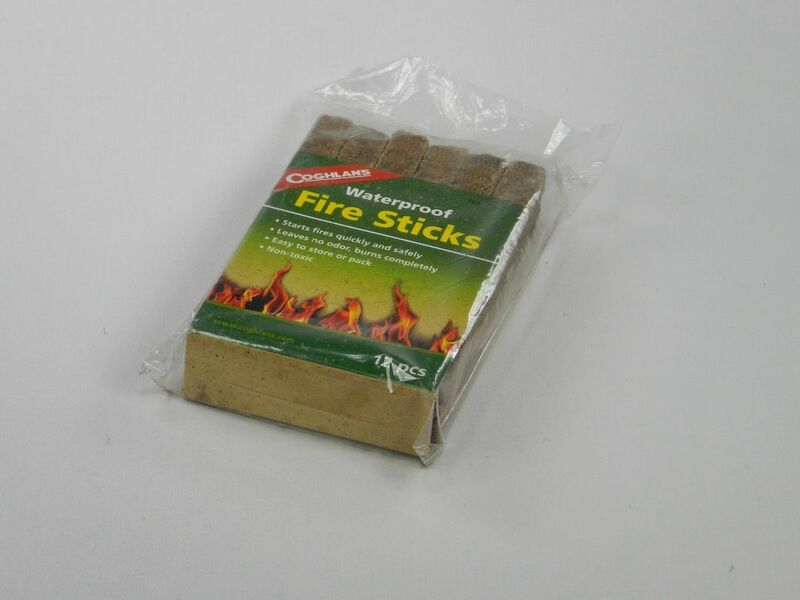 Although we carry other firestarting aids one small and cheap item that we like to carry to help get our tinder going, especially when it is damp out, is a couple of dried out paper/wax milk cartons. Although not the highest tech approach, lighting one of these milk cartons will give you a good source of flames to get your tinder burning it all kinds of weather. 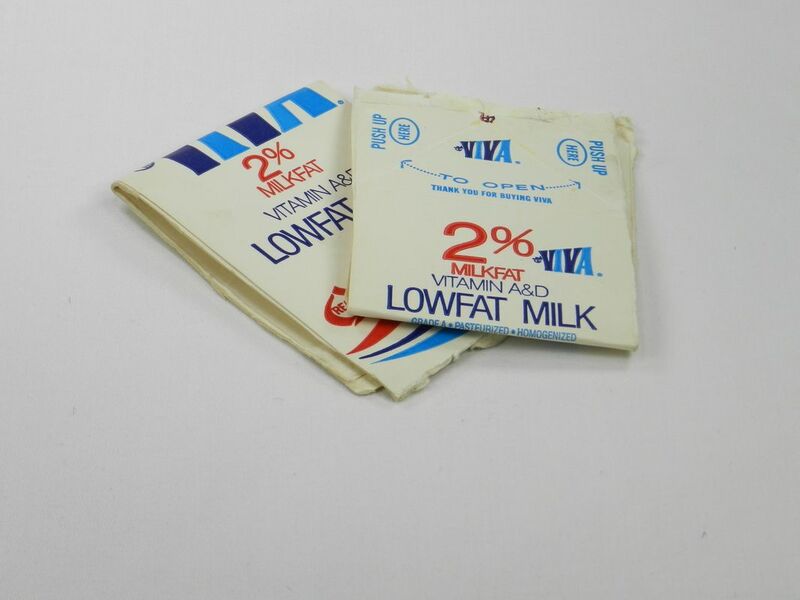 You can buy milk cartons (and milk) at your local grocery or convenience store. Regardless of what you use for the initial flame (e.g. 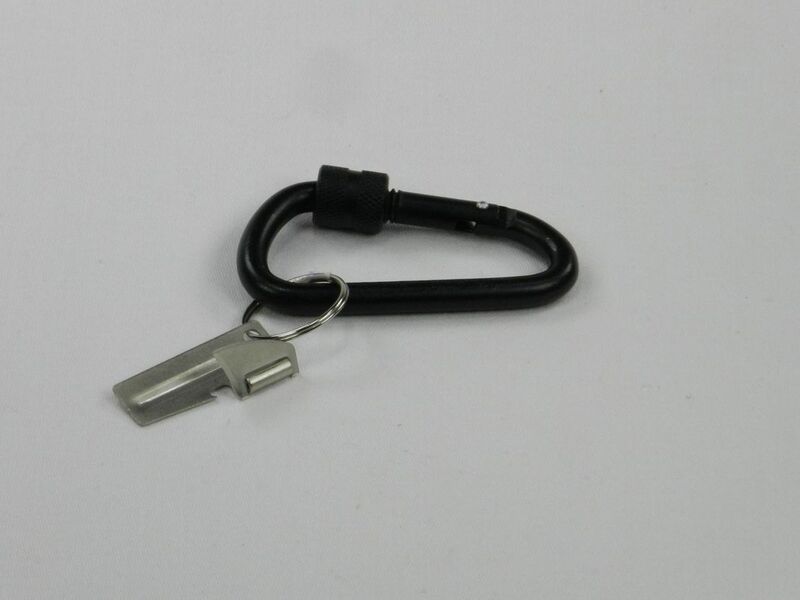 butane lighter, waterproof matches, or magnesium rod) to make sure that you can start a fire in an emergency situation you need all the help that you can get. That’s where waterproof firestarter blocks come in. The criteria that we use to evaluate waterproof firestarter blocks are: 1) confidence in lighting 2) waterproofness and 3) weight. For us the Coghlan’s Waterproof Fire Sticks have started every time on the first attempt to light. With a fire stick lit it gives us time to get the natural tinder burning to really get the fire lit. You can buy these fire sticks at Amazon. On really wet days in the backcountry it can be hard to even find tinder to start a fire. When that happens you need to have your own tinder in your backpack. The criteria that we use to evaluate tinder are: 1) reliability of ignition, 2) duration of burn, 3) longevity of storage and 4) messiness. For emergency tinder we like Coghlan’s Emergency Tinder. It’s made of fibers and wax and lights without needing a flame. Once lit it will burn for 5 to 7 minutes. It’s also non-toxic, odorless and far less messy than many other alternatives. 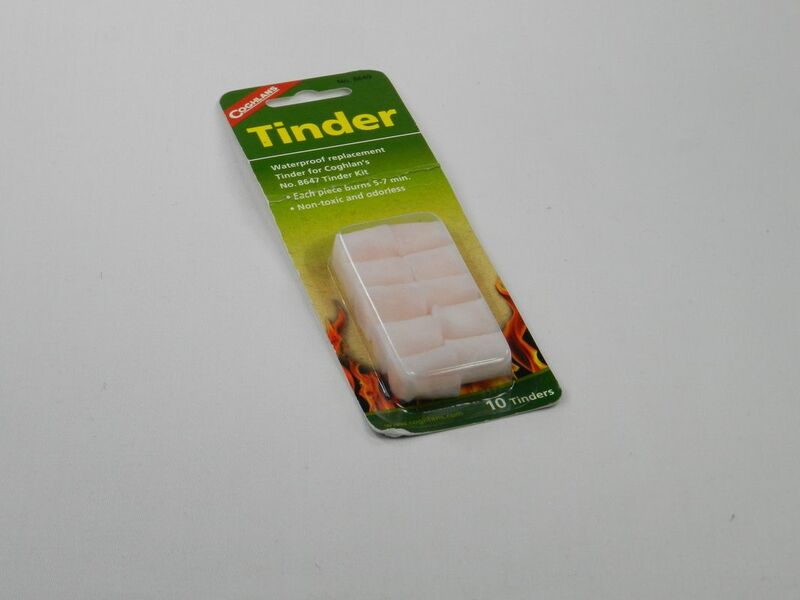 You can buy this firestarting tinder at Amazon. Although we like to have a real fire at our campsite whenever possible to cook over and to light the area, in some places building an open fire is either not allowed or feasible. 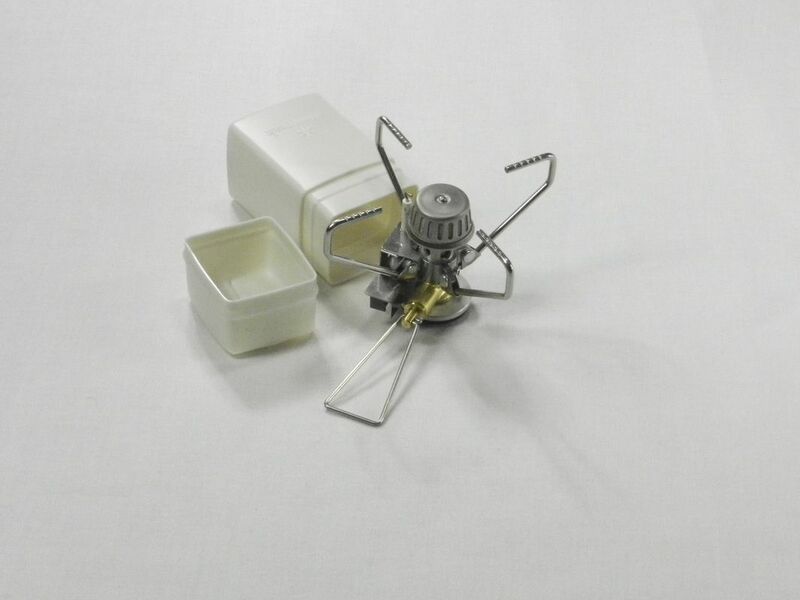 For those situations we use a compact backpacking stove. 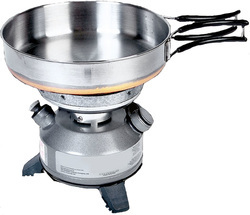 The criteria that we use to evaluate compact stoves are: 1) ability to generate heat, 2) size, 3) stability with a pot or pan on it, 4) flame adjustability, 5) weight, 6) fuel type, 7) ease of ignition and 8) price. We like the Snow Peak GigaPower Auto Stove for a wide variety of reasons. The stove is rated at 10,000 BTUs so it heats up and cooks food very fast. The stove measures 2.6" x 4.2" x 4.2", weighs less than 4 oz, and comes with a small plastic case about the size of your fist for compact protective storage. The four arm pot support is much more stable than the standard three arm design found on other stoves. The built-in Piezo igniter lights the stove without searching for another ignition source; even in cold temperatures and at higher elevations. The flame can be reduced to a simmer for actual cooking. Boil time for a liter of water is approximately 5 minutes. All in all, this is a great little stove for when you can’t have a fire or need to heat things on the go. You can buy this compact stove at Amazon. Since the wind can have a significant impact on your stove’s ability to keep the heat focused we think that having a windscreen for your stove is a good idea in most environments. Although you can easily make a windscreen from a piece of sheet metal, over the years we have found that the screens specifically made for a stove normally do just as good a job but are less trouble to pack and keep clean. The criteria that we use to evaluate windscreens are: 1) ability to block the wind, 2) fit to the stove, 3) stability with a pot or pan on the stove with the windscreen, 4) size, 5) weight, and 6) price. Since we use a Snow Peak GigaPower Auto Stove we went ahead and also bought the Snow Peak GigaPower Stove Windscreen. The windscreen measures 0.6 x 4.5 x 4.5 inches and weighs 0.13 pounds. The screen easily attaches to the stove and slightly increases the stove’s stability. It does a good job blocking the wind, reflects the heat back towards the pot and helps increase the efficiency of the stove so it takes less time to boil water or to cook other food. You can buy this windscreen at Amazon. 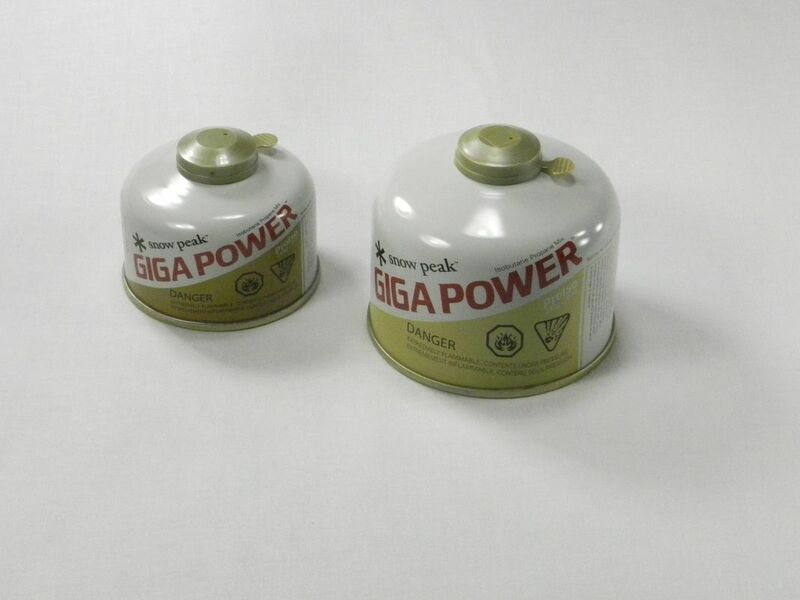 To go with the Snow Peak GigaPower Auto Stove there are two sizes of fuel canisters; 4 oz and 8 oz. The criteria that we use to evaluate compact stove fuel canisters are: 1) burn duration, 2) size, 3) weight, 4) likelihood of leaking and 5) price. The GigaPower ProIso Fuel Canisters are specifically made to fit the GigaPower Auto Stove and are a mixture of 85% IsoButane and 15% Propane. The 4 oz (110 gram) canisters are 3.25" x 2.5" and will burn for 50 minutes on high. The 8 oz canisters (250 grams) are 4" x 3.5" and will burn for 85 minutes on high. The fuel is rated to work at temperatures above 15 degrees Fahrenheit, but can work in colder temperatures if you keep the canister warm (e.g. put it in the bottom of your sleeping bag on a cold night). The 110g canister will heat a liter of water to boiling approximately nine times if the weather is not too windy. So with the larger 250g canister you should be able to boil 6 liters of water a day for 3 days; more than enough to last most weekend adventures. You can buy these 110 gram fuel canisters and 250 gram fuel canisters at Amazon, or at your local outdoor store where they may be less expensive. For us one of the items that turned out to be the hardest to find was a good set of cookware that you can use on both an open fire and on a compact stove. Since these days most “cooking” is focused on boiling water to rehydrate freeze-dried food most of the cookware cannot get near a real campfire without being damaged or destroyed. 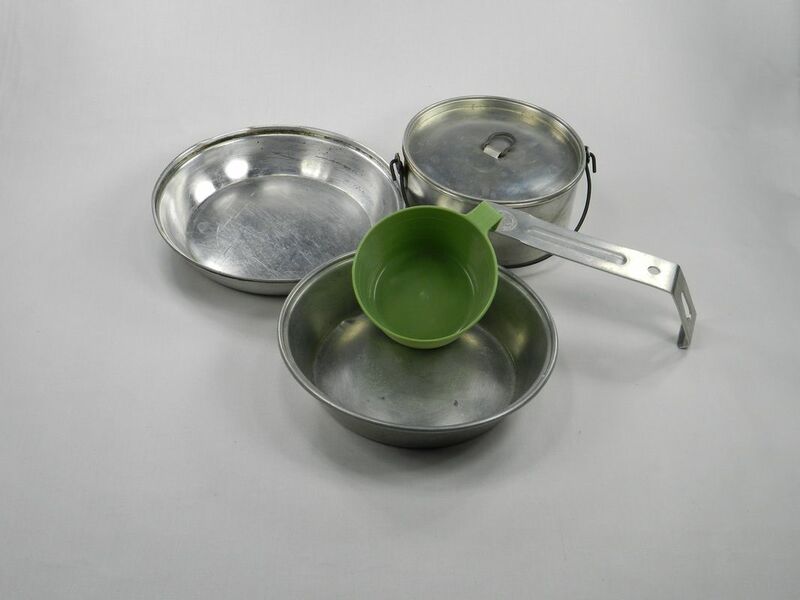 The criteria that we use to evaluate cookware are: 1) ability to be used on open fire and compact stove, 2) number of containers, 3) are there pots and pans, 4) packed size, 5) weight and 6) price. The Olicamp Backpacker Cookset is great if you are cooking for 2-3 people in the backcountry. It comes with a 1½ qt. kettle with lid, 1 qt. kettle with lid, frying pan, two measuring/drinking cups and a storage sack. The set is made out of 18/8 stainless steel which allows it to be used on both our GigaPower stove and on our fire. The set weighs 1.14 lbs. You can buy this gear at Get Out Outfitters. 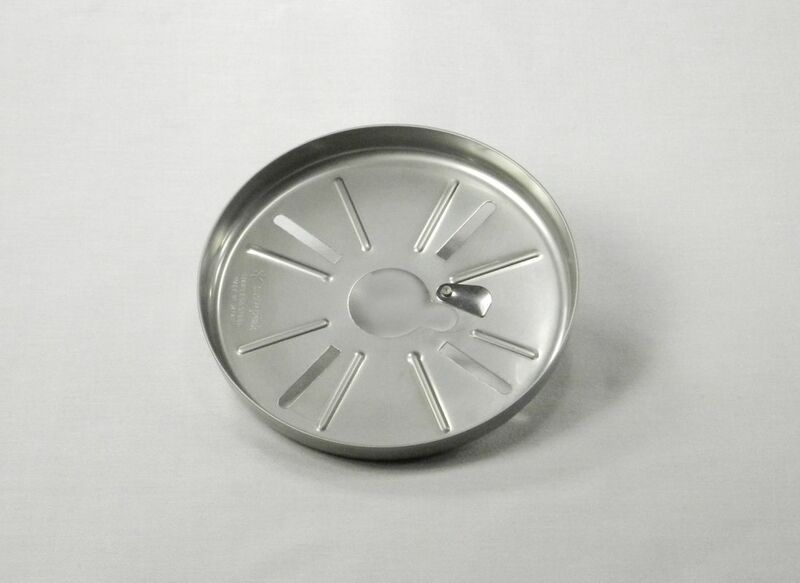 To complement our cookware we like to have more than a spoon as a cooking utensil. But since we don’t want to worry about packing odd shaped implements in our pack we looked for a set of folding cooking utensils. 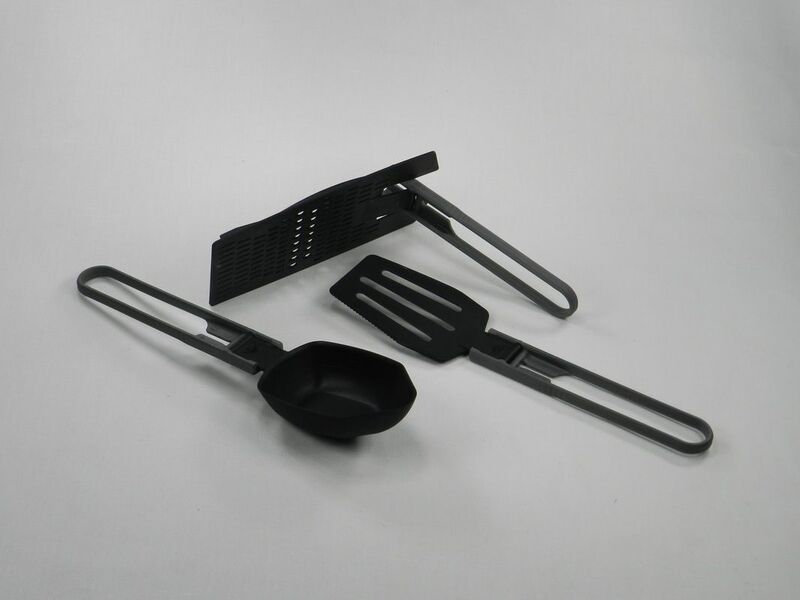 The criteria that we use to evaluate cooking utensils are: 1) similarity to real kitchen utensils, 2) ability to be easily stored in a backpack, 3) strength, 4) ability to stay open when cooking rather than fold up at the worst possible time, 5) weight and 6) price. We purchased the MSR Alpine Folding Utensils because they seemed to match what we were looking very closely. The set includes a spatula, a spoon and a strainer that can also be used as a cheese grater. The utensils are made of a no-stick material so they clean up fairly easily. The set only weighs 2.9 oz, so these utensils are obviously not as strong as the utensils you might use at home, but we think that they strike a good balance against all of our evaluation criteria and we like them. You can buy these cooking utensils at Amazon. Like my backpack I have had my mess kit for years and have never found any compelling reason to get new one. However, I have looked at more recent mess kits to recommend them to friends. The criteria that we use to evaluate mess kits are: 1) ability to use the kit to eat off of and to cook with, 2) number of containers, 3) is there a pot and a pans, 4) packed size, 5) weight, 6) what type of metal is the kit made of and 7) price. The BSA kit that I use is stainless steel one-person mess kit that comes with a 7" Frying pan with steel folding handle, a 3/4 quart pot with lid, a 7" plate, and an 8 oz drinking/measuring cup. The kit weighs 1.3 lbs. You can buy the current aluminum version of this gear at Scoutstuff.org or a similar stainless steel Olicamp mess kit at Amazon. 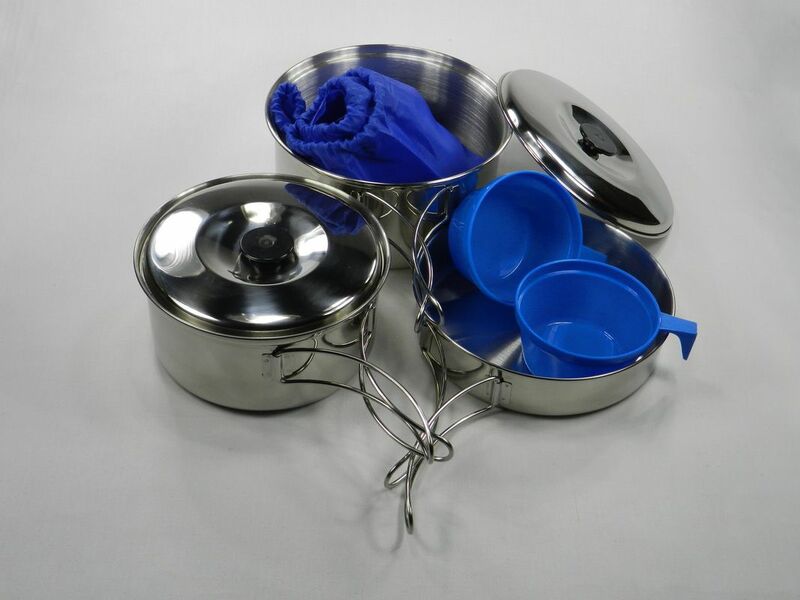 ​We really prefer stainless steel for cooking – so the Olicamp mess kit is probably a better choice if you are going to use the mess kit for more than just eating off of. Although I use a mess kit that I have had for years, when it came time to buy my wife and daughter mess kits I had to look around for something different since the mess kit that I use is no longer being made and the replacement is made out of aluminum; which I do not prefer since it is less sturdy and heats too fast for me. The criteria that we use to evaluate mess kits are: 1) ability to use the kit to eat off of and to cook with, 2) number of containers, 3) is there a pot and a pans, 4) packed size, 5) weight, 6) what type of metal is the kit made of and 7) price. After looking around we bought the Olicamp mess kit. The mess kit is made of Commercial Grade 18/8 Stainless Steel, packs into a 3” x 7” space when everything is nested together and weighs 15 oz. 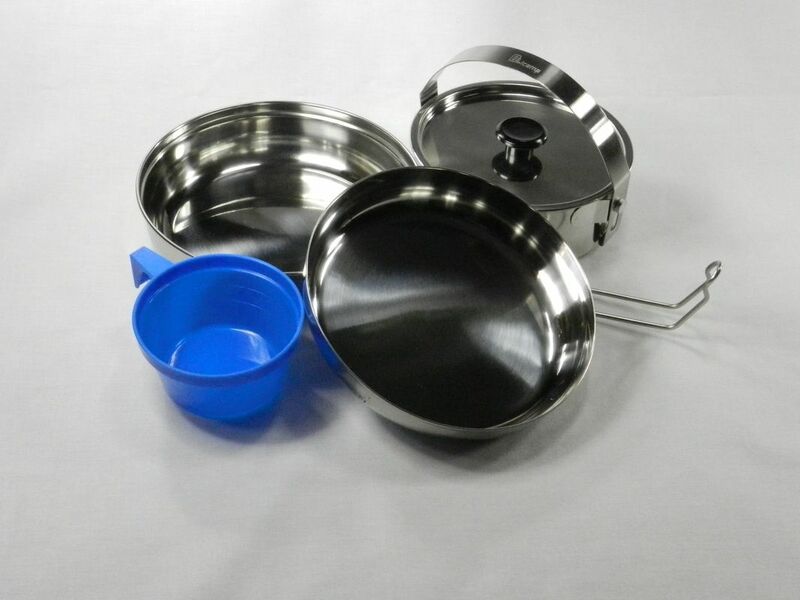 The set includes a 6 ¾” Fry Pan, 6 ½” Plate, 16 oz Pot with Lid and an 8 oz Plastic drinking/measuring cup. You can buy this Olicamp mess kit at Amazon. As with our cooking utensils we like to have more than a spoon to eat with. We like to also have a knife and a fork to use as appropriate. The criteria that we use to evaluate eating utensils are: 1) is there a spoon, fork and knife in the set, 2) compactness of packed utensils, 3) strength, and 4) price. 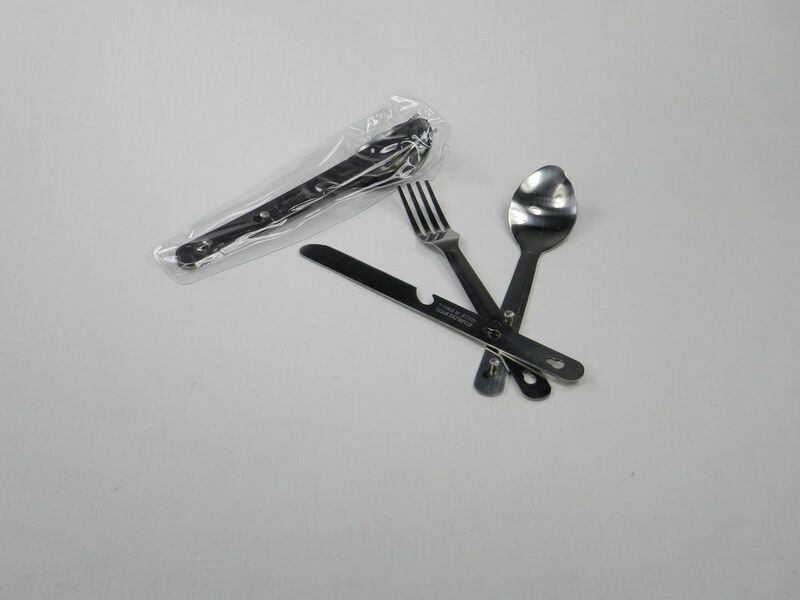 We use the 4 N 1 Stainless Steel Camping Hiking Emergency Eating Utensil set since it is made of lightweight stainless steel has all 3 utensils (and a bottle opener on the knife), and packs together nicely when not in use. You can buy these eating utensils at Amazon. 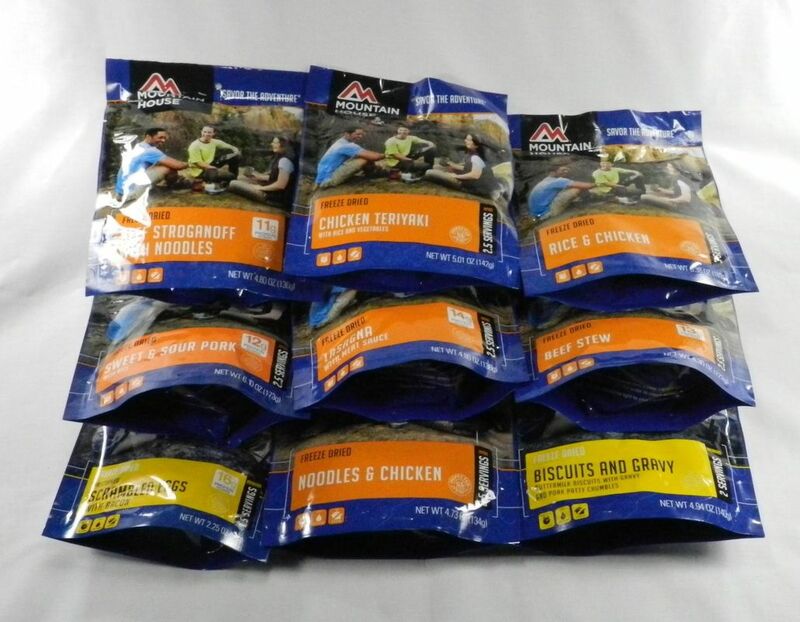 In addition, if you want to buy Mountain House freeze-dried food in bulk (so that it is approximately 30% less expensive per meal or to have some emergency food in the house), you can also buy Mountain House food in bucket containers. We like the "Classic" and the "Breakfast" buckets. The Classic bucket has 12 meals (2 x Beef Stroganoff, 2 x Chicken Teriyaki, 2 x Beef Stew, 2 x Lasagna with Meat Sauce, 2 x Noodles and Chicken, 2 x Granola with Milk and Blueberries) and the Breakfast bucket has 16 meals (4 x Scrambled Eggs with Ham & Peppers, 4 x Scrambled Eggs with Bacon, 4 x Granola with Milk & Blueberries, 4 x Breakfast Skillet). 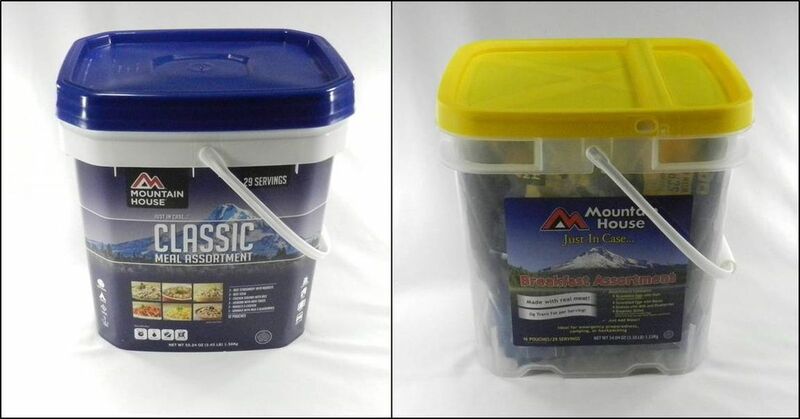 You can buy the Mountain House Classic bucket and the Breakfast bucket at Amazon. Every good cook knows that salt and pepper is essential to bring out the flavor of the food. Even when we are camping we don’t want to live like barbarians; so we bring a small salt and pepper shaker with us. Years ago we would carry “picnic” salt and pepper shakers in a Ziploc bag, but we found that the salt always leaked into the bag so we looked for a better solution. The criteria that we use to evaluate salt and pepper shakers are: 1) size, 2) ability to hold both spices and 3) ability to not leak. The GSI Outdoors Salt & Pepper Shaker was just what we were looking for. 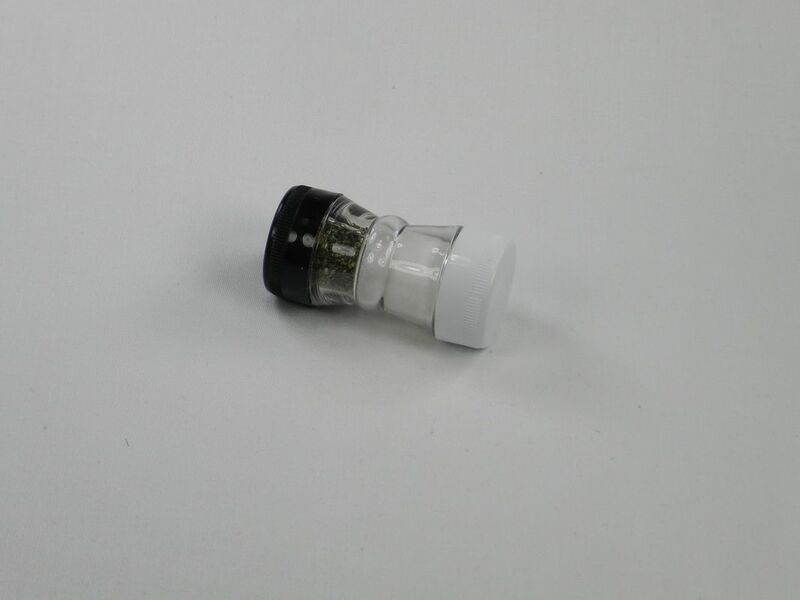 It has a compact design that holds both salt and pepper, and the waterproof screw caps keep everything from spilling or getting wet. You can buy this salt and pepper shaker at Amazon. Ostensibly tooth picks are for exactly that, or for chewing on. We find that they have many other uses when we are camping such as tinder for starting a fire, small wooden dowels, poker chips, and other assorted jobs. They weigh next to nothing and come in handy – so we take them along and think you probably should too. 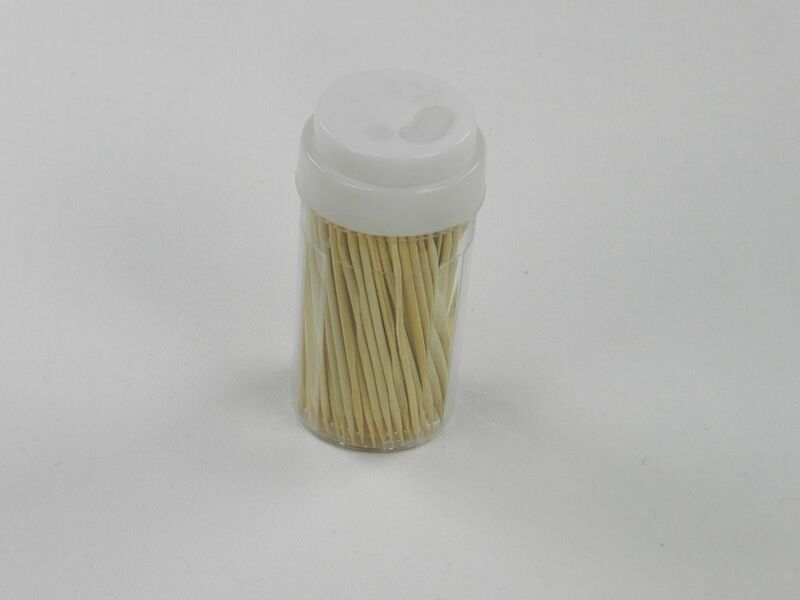 ​​You can buy toothpicks in a small container at your local grocery store. We’ve all been there - a can that needs to be opened and no can opener. That’s why we always make sure that we have a couple of P-38 can openers with us. They’re small, so when we only take one, we sometimes have a hard time finding it. When we take two or three we always seem to be able to find them all immediately. Not sure why that is – but that’s what seems to happen. You can buy the P-38 (which is 1 ½ in. long) at Amazon; or the P-51 (which is 2 in long). To carry liquids that we use for cooking we like to make sure that whatever we take doesn’t leak all over our packs and other gear. 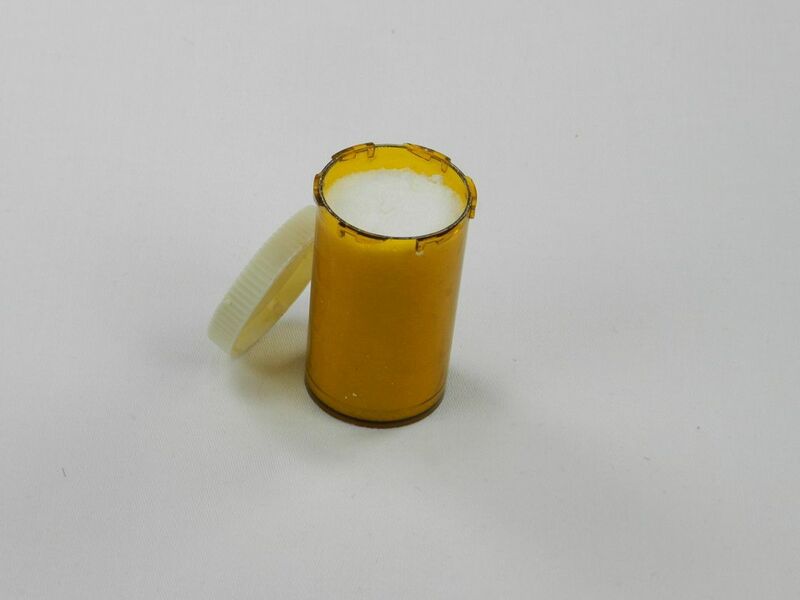 The criteria that we use to evaluate these small containers for liquids are: 1) capacity, 2) leak proofness, 3) ability to see what is in the container and 4) price. A couple of years ago we found GoToobs in a travel store and started to use them for shampoo and conditioner for normal trips. After finding that we liked them we decided to give them a try for camping and they have worked out well. The GoToobs are made from soft, FDA food-safe, 100% BPA and PC-free, squeezable silicone, have a large opening for filling and a no-drip valve in the cap which prevents leaks. 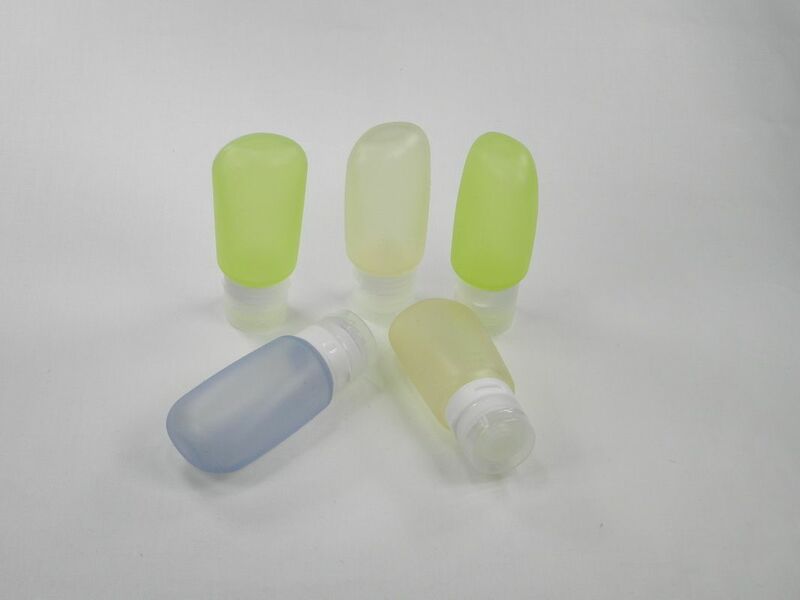 We use the 3 fl oz bottles which are 1.6" x 4.5" and weigh 2 oz. Although they are fairly leak proof, they sometimes leak a little if the liquid that we put in them is really thin (e.g. more the consistency of water than shampoo). So we fill them up and then toss them all in a zip-lock freezer bag just to make sure that no leaks occur. You can buy these containers at Amazon. When we are in the backcountry we always find the need for bags to hold things. Could be interesting rocks, could be water. We never know but we always seem to run into this. 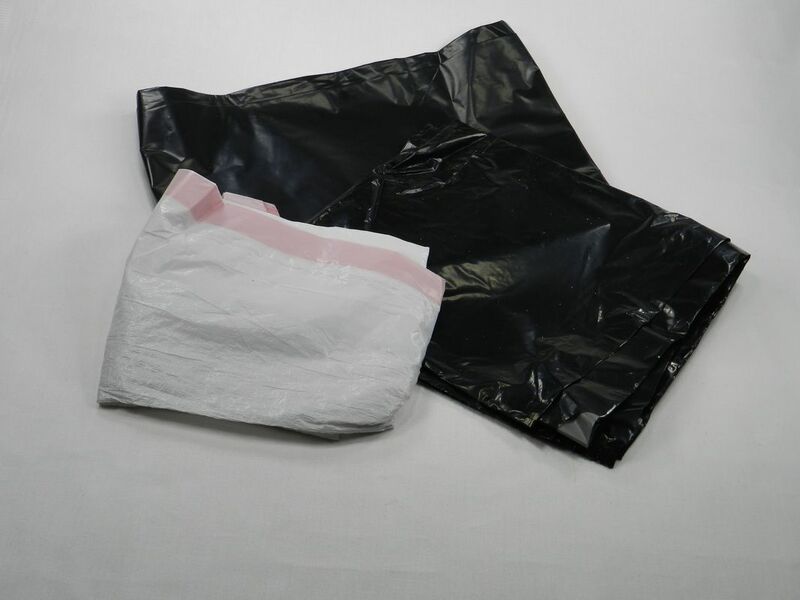 To cope with the situation we always carry a variety of ziploc plastic bags with us. 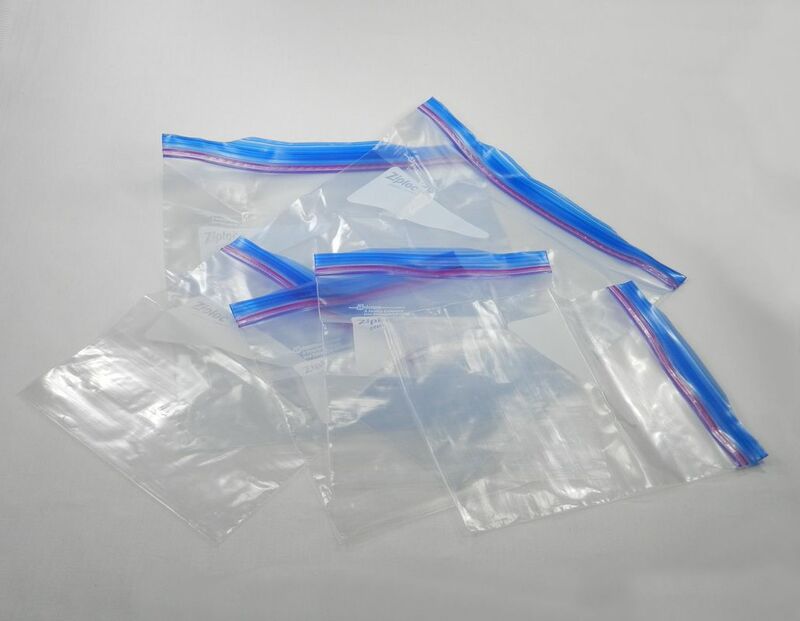 We use the freezer bags since they have a double zipper top and are made of thicker plastic. You can buy Ziploc bags at Amazon or at your local grocery store. Perhaps it’s the Boy Scout in me – but I like to leave the places that I have been cleaner than they were when I got there. Consequently I always take one or two Glad trash bags with me when Camping. In addition to picking up and packing out trash, we have found that we use the trash bags for lots of other things too. Storing wet clothes. Protecting tinder and firewood from the rain. Protecting a backpack. Making a poncho for someone that forgot to bring their rain gear. You can buy trash bags at Amazon or your local grocery store. 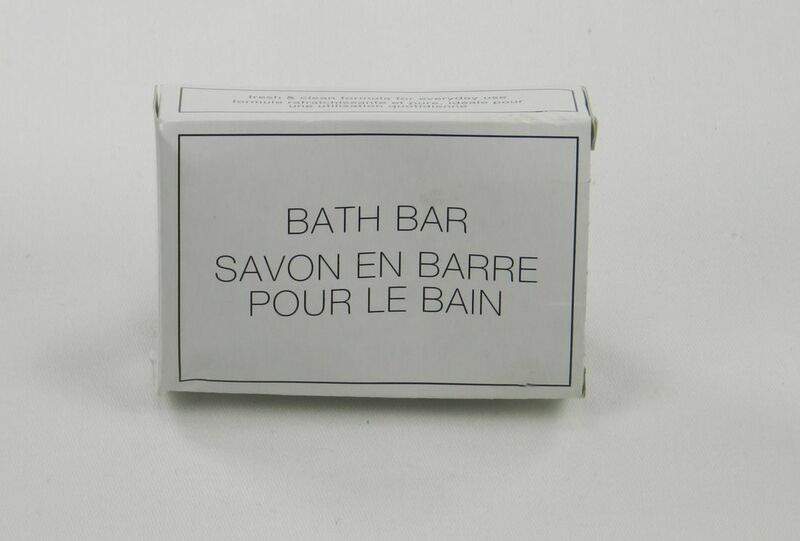 In addition to a normal bar of hand soap we have found that having a general all-purpose soap for washing dishes, washing clothes, and washing your hair and body is also necessary. The criteria that we use to evaluate all-purpose soaps are: 1) does it actually clean things, 2) how concentrated is it – how much do you need to use, 3) is it unscented or scented, 4) is it environmentally friendly, 5) weight and 6) price. After trying a few different soaps we settled on Campsuds in Nalgene. This soap is very concentrated, cleans well, can be used to clean all sorts of stuff and is fairly neutral on the environment since it is made of purified water, vegetable-based biodegradable anionic and non-ionic cleaning agents, natural fragrance, oils and germaben. 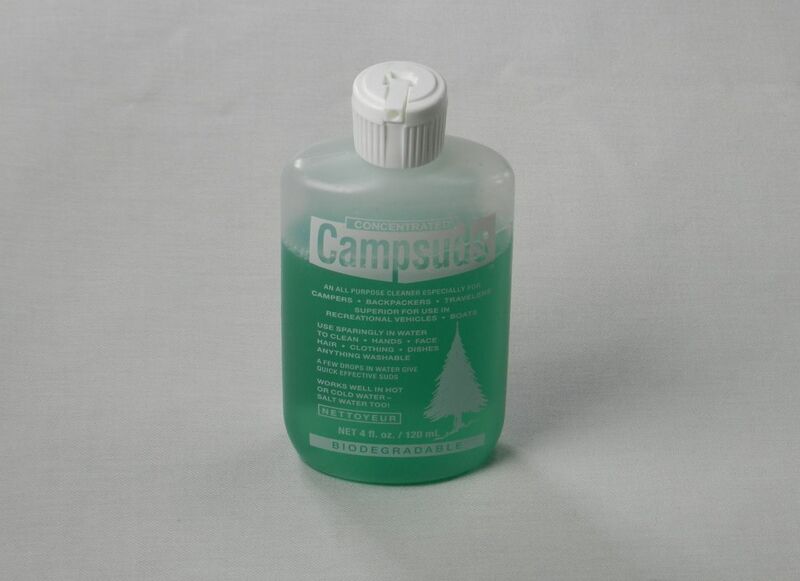 You can buy Campsuds in Nalgene at Amazon. If you spend any time in the backcountry you are going to have to go to the bathroom. When you do it’s good to be prepared with toilet paper instead of looking around for the best leaves. The criteria that we use to evaluate toilet paper are: 1) utility, 2) comfort, and 3) protection from water. 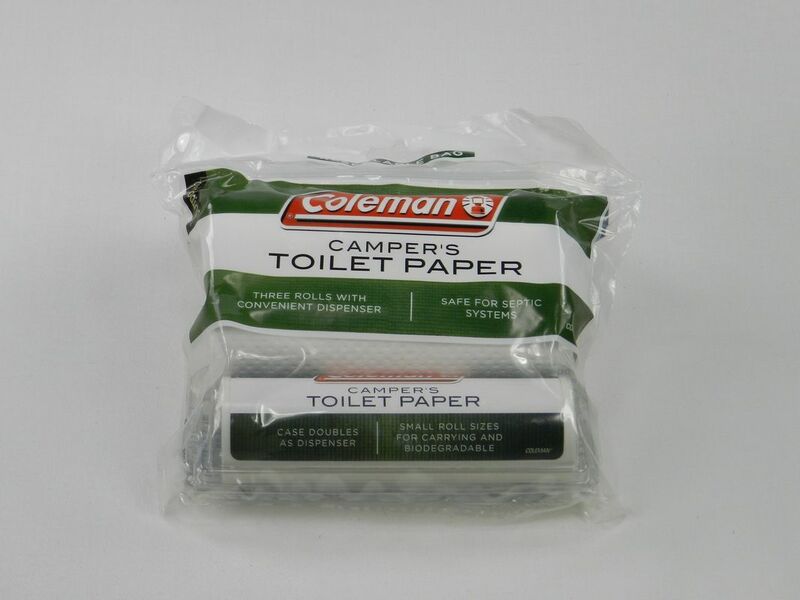 The Coleman Camper's Toilet Paper comes in three rolls per package. The paper is biodegradable 2-ply tissue with each roll having approximately 65 squares. The package also comes with a waterproof case that doubles as a dispenser. The 3-pack measures 4.9" x 4.7" x 5.9" and weighs 2.4 oz. The toilet paper roll itself is approximately 4 1/2" x 1 1/4". You can buy this toilet paper at Amazon.